How do you keep a high vertical earthbag wall that is straight from toppling over? 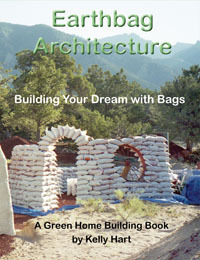 This is always a concern when designing and building standard rectilinear buildings with earthbags. The conventional solution generally relies on periodic buttresses and/or heavy-duty reinforced concrete bond beams at the top of the wall. 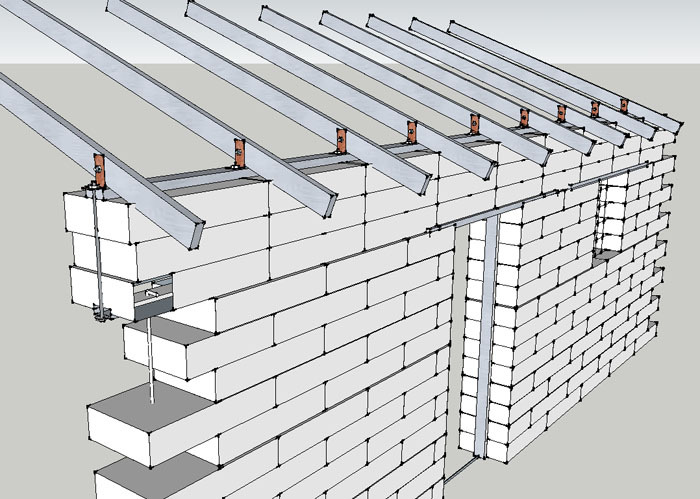 I have come up with a simpler solution that is much easier to install, requires no concrete or buttresses, and also provides hurricane and earthquake protection for the walls and the roof framing. 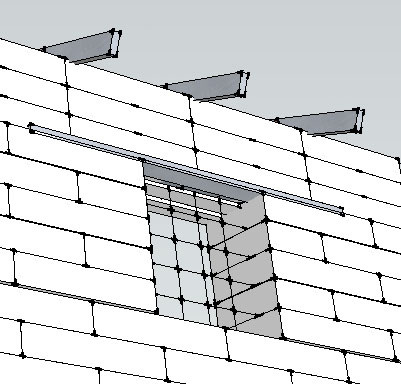 At the same time this method will automatically provide strong lintels over doors and windows. The idea is that during construction, once you have arrived at the height where you are at the level of the top of any door or window (presuming that these are the same height), you lay down a piece of hollow, rectangular-section steel tubing right on top of that last row of earthbags. It is also possible to do this pieces of wood by using somewhat larger dimensions, but I prefer metal because it is stronger and more reliable in its characteristics. It should be as long as the wall is, going from the center of one corner to the center of the other corner. In most localities you can purchase such tubing up to 6 meters (20 feet) long, and two pieces can be strapped together if necessary, using connection plates that are either welded or bolted in place. This tubing can be various sizes, depending on how long the wall is, but I recommend about 1 1/2" X 4" in general. It would be a good idea to have made this area as level as possible, through tamping or even shimming some bags, so that the steel beam will lie as level as it can. Before putting this first piece of steel in place, it should be pre-drilled with 1/2" holes at 1 foot intervals all the way through both sides of the metal in the center of the long dimension. Also it would be a good idea to pound 1/2" rebar pins through all of the bags in the middle of every corner and adjacent to door and window openings. If you look at the above cross-section detail you can see that there is a piece of 3/8" rebar about 2 feet long with one end bent over 90 degrees. Such pieces of rebar can be pounded down through every other hole and into the bags below. But don't pound them all the way down yet, because you also want to install some 2 foot sections of 1/2" threaded rod (sometime called "all-thread") sticking up vertically in each of the empty holes that are left. These need to be secured with steel washers and nuts underneath the beam, so they can't be pulled out. Once all of the pieces of threaded rods are in place, you can finish pounding down all of the rebar anchors. Now the whole assembly should remain fixed fairly securely in place. Wherever the threaded rods are over doors or windows you may need to put a nut on the rod on top of the beam so that it won't fall through the hole. Also, the lower washer and nut can be recessed into the beam by drilling a large enough hole on the lower side of the beam to do so. This will allow other window or door assemblies to be joined flush with the beam. Now you can place some extra pieces of the same type of tubular metal over the door and window openings on either side of the original beam, so that they are long enough to extend maybe 1 1/2 feet on either side of the opening. These can also be pinned into place with similar rebar pins. This will become a platform over which more earthbags will be placed. 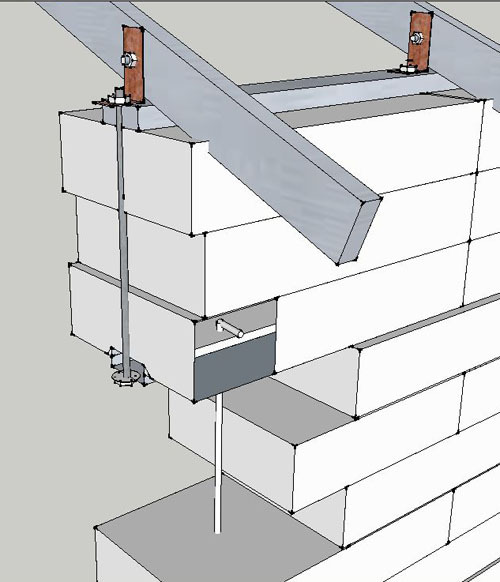 At the corners where two bond beams meet, the metal beams can be connected rigidly with 90 degree metal brackets on either side of each beam, through-bolted in a similar manner. This will make the entire structure integrally connected, which should withstand considerable force from earthquakes or wind. A pin of 1/2" rebar pounded down through all of the bags at each corner will also help integrally tie the whole building together. At this point you are ready to start laying more earthbags. These should be filled so that they will be 2 feet long when tamped into place. This may mean that they will need to be hemmed or stitched at the top, if there is not enough material to fold over and seal them that way. They will be placed directly between the threaded rods and tamped thoroughly into place. It might be possible to pierce the subsequent row of bags with the threaded rods in order to maintain the staggered, brick-like layering of bags, but it will be easier to just place them above each other and between the rods. Because these bags will be eventually clamped together to form the band beam, it doesn't really matter much whether they are staggered or not. In most cases, three rows of bags can be arranged this way, but depending on the intended height of the wall, you can also lay fewer or more rows, as long as the threaded rods are long enough to extend above the upper beam. This upper steel beam needs to be prepared with 1/2" holes drilled to match exactly the pattern of the lower one so that it can be placed in the middle of the top-most bags with the ends of the threaded rods protruding all the way through. In this case there is no real need to also pound rebar pins through the bags, since this whole assembly will be clamped tight as a unit, so fewer holes need to be drilled through the upper beam. It may take some fiddling with the threaded rods and the beam to get them aligned, but it should be possible. Before the washers and nuts are put onto the rods, you want to position metal L-brackets wherever there will be rafters or joists. 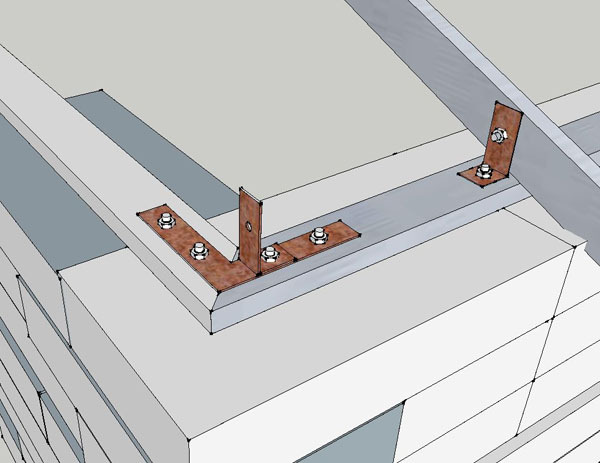 These brackets will connect these roof members to the bond beam in a solid, yet flexible manner. As you tighten down the nuts on all of the threaded rods, be sure to check the level of the beam, making sure that it becomes as level as possible, so the roof itself will be level. It may be necessary to tighten some of them more than others. You want this whole assembly to be clamped tightly together so that there is no chance of any of the bags becoming dislodged, but there is no reason to over tighten them either; you don't want to overly bend or stress the metal. Stabilizing door and window openings is an important part of making a strong building. The rebar pins already pounded into these areas will help do this, but other measures can also be taken. If you have an existing steel door frame, this can be integrated into the structure as it is built, and this will help stabilize the door opening. The above photo show one such door and its frame braced into position and bags being stacked against it. 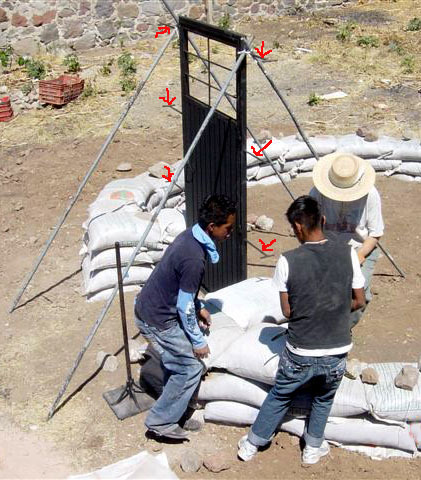 (The photo shows a dome being constructed, but the concept is the same with vertical-walled structures.) You can see in the photo several horizontal steel bars that were welded to the door frame in advance. These anchor bars were carefully woven into the bag wall as it was erected, firmly attaching the door frame to the wall and stiffening the wall at the same time. There is a tendency for the bags to splay some around the door frame, so if you have such a door assembly manufactured in advance, I suggest making the frame quite large (perhaps 3 or 4 inches square). 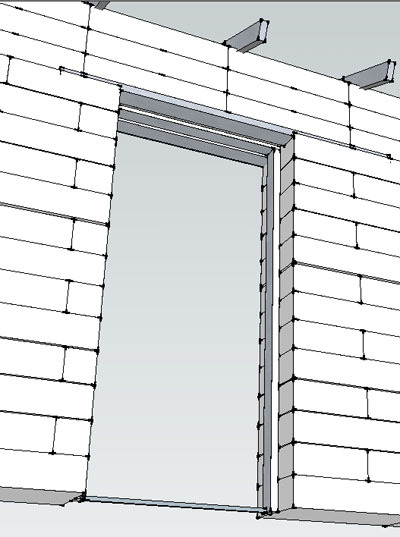 Another approach to creating a door frame is to wait until the bond beam is already in place. Then the metal (or wood) of this beam can become part of the frame by attaching similar steel tubing on either side of the door to it, using metal brackets or cutting flanges that can be screwed or bolted into place. If you want to get fancy, you can have several pins welded to these side pieces that will pierce the ends of bags as it is positioned. 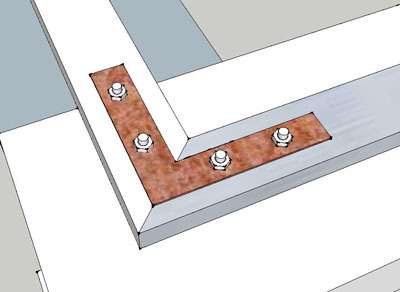 To complete the frame, a threshold piece can be connected at the base, or a piece of angle iron can be either welded, screwed or bolted at the base, which will later be imbedded in a concrete floor. Window frames can be created in a similar manner as the door, either using pre-existing frames, or even simple grated ironwork. There are many possibilities here, depending on what is available and desired. I think that this concept can be adapted to a variety of rectilinear building projects in such a way as to provide safe and secure structures, easily and economically.